Seeing the increase in posts on various currency pairs, we have decided to start generic threads, this one being for EUR/USD. 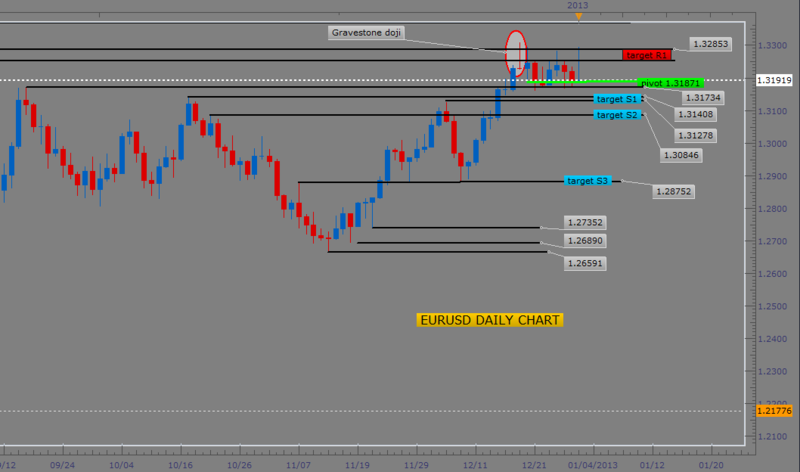 All items related to EUR/USD should go in here, *unless* there is a specialized topic or question related to EUR/USD. We will err on the side of caution and assume discussions on the pair should be in this thread. I hope this will keep the forums clean, discussions coherent and synchronized. Thanks. You may have to re-access your position especially if you are long because the bears are yet to tire out. After forming a gravestone doji on 12/19/2012, price has been bouncing between the high of this pattern at R1 and pivot. As long as price remains above pivot, the bulls have the advantage and this is why we saw another challenge of R1 today. However, our gravestone doji exerted authority with this challenge and price is once again testing pivot. We need a daily close above R1 or below pivot for direction. See chart for pivot and relevant targets. Euro price has completed a dark cloud continuation pattern below pivot which is very bearish as this pattern is adding strength to the gravestone doji that caused the bearish reversal to begin with. We need a close below S1 for momentum based on dark cloud to increase towards S2 and beyond. Of course, should we get a close above pivot, then our dark cloud momentum fizzles out and is negated. See chart below for pivot and relevant targets. EURUSD - dark cloud continuation pattern negated - bulls are back! Price negated dark cloud continuation pattern mentioned in previous analysis with the completion of a tall blue candle yesterday that closed in the R1 zone. This is clearly bullish with price now testing R2 at the time of this writing. As long as price remains above pivot, the bulls are in control again. See chart below for pivot and relevant targets. I entered a buy at the close of tall blue candle on vollatility101 yesterday after taking a loss on a sell. Patterns are powerful but when they fail, their failures are just as powerful because you have a predetermined stop that manages your risk and you have the opportunity to get in in the other direction because a pattern failure is usually a clear indication of change of direction. My sell was kicked out for a loss on onepipatatime as well; however, I was already in a buy based on an entry point specific to this strategy and this buy is in a great floating profit at the moment. See trades for both strategies below. EUR/USD will continue its bounce and it should touch 1.34 if not today then definitely on Saturday even with the absence of any market events or publications that could affect weekend trading. The US economy is still a problem with the unemployment rate and job numbers turning out to be disappointing. Then we have the elephant in the room which is the debt hanging overhead. The Euro has appreciated as the US dollar fell with the ECB interest rate remaining unchanged at 0.75%. ECB President Mario Draghi was hawkish in his opening remarks at the press conference that drove the Euro upwards. A market event to watch out for tomorrow afternoon will be the US Core Retail Sales figure which can be monitored on Bloomberg/Reuters. It will be released at 1:30PM GMT and a low figure means that the EUR/USD will appreciate. The opposite is true for a high value since the USD is in the denominator here. [quotePrice negated dark cloud continuation pattern mentioned in previous analysis with the completion of a tall blue candle yesterday that closed in the R1 zone. This is clearly bullish with price now testing R2 at the time of this writing. As long as price remains above pivot, the bulls are in control again. See chart below for pivot and relevant targets. 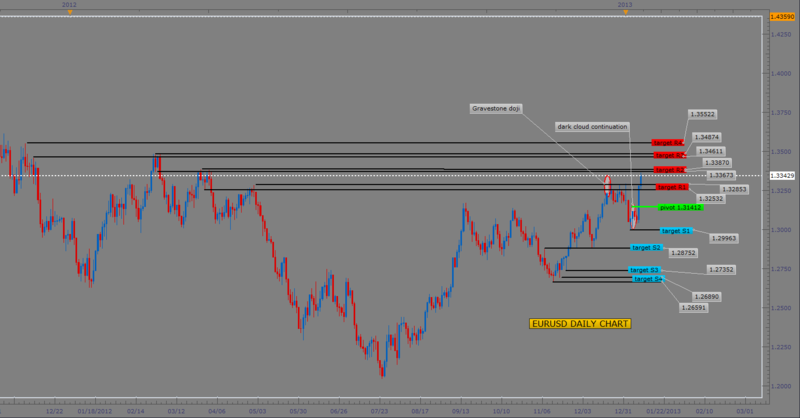 Price is currently testing the R2 zone illustrated in chart that went with above post. I am attaching chart pic again for refernce purposes. Any pull back at this point can be regarded as a buy opportunity as long as price remains above pivot. Targets still relevant. 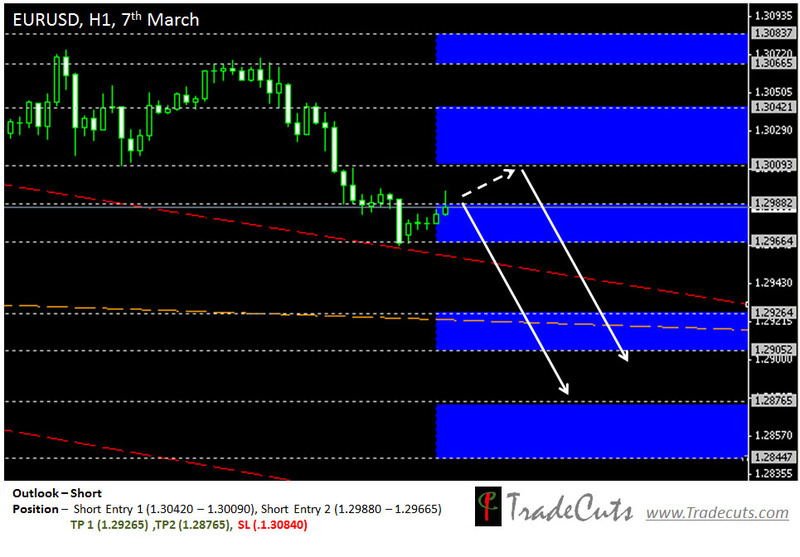 EURUSD - could dark cause a retracement down towards pivot? Price completed a dark cloud yesterday against R2. Pivot is still at 1.31412 and as long as price remains above pivot, the bulls have the advantage on the daily chart; therefore, eventhough we see a dark cloud here, it is not an indication of a reversal at this point, but merely an indication of a possible retracement that could take place here towards pivot before we get our next push up. Even if price does trade below pivot, S1 is a weekly pivot which has the potential to also send price up should price make it down there. So, for now the bulls are in the drivers seat but based on dark cloud, there is a strong possibility that we could first see a retracement to the downside before the next push up. See chart below for pivot and relevant targets. Last day, on 15th Jan; the euro has fallen to the level of 1.3250, just a bit above the axis of 1.3241. This level is supposed to provide a support, and now in the American affair the euro bounced aloft this level. This level is a key, so if the euro closes beneath estimated level, the fall in the euro would be secure to the level of 1.30. For yet another day the Usd pairs remain in flux with no clear direction, still testing strong supports. 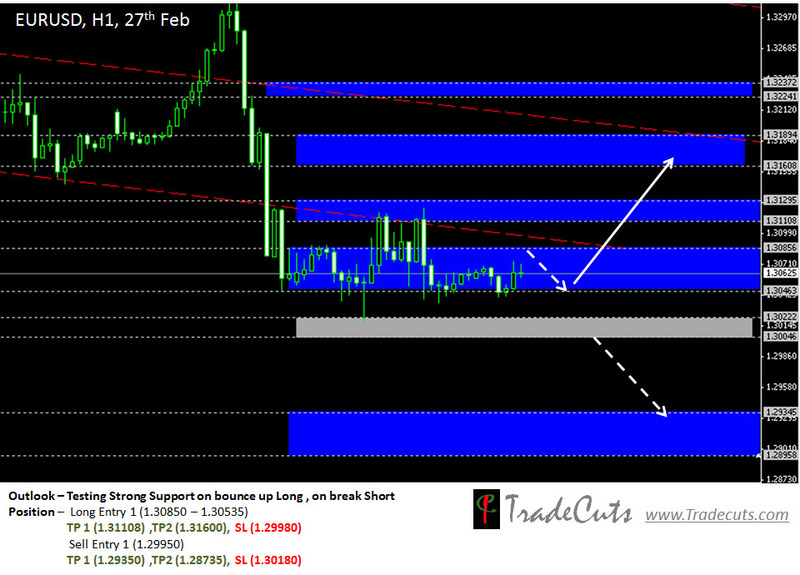 Currently our outlook is cautiously Long.Here is our technical outlook for Eur/Usd. If you take this trade let us know how it worked out for you. The Euro zone stock markets had a rally today; EURO STOXX (FEZ) went up 0.4%, London's FTSE 100 (BCYIF.PK) eased up 0.3% and France's CAC 40 also rose 0.4%. With the central bank comments and the stimulus program that is ongoing in the EU, one wonders how healthy this is going to be for the Euro. We all know how stimulus programs negatively affect currencies and send stock markets soaring. This is exactly what is happening in the Euro zone. 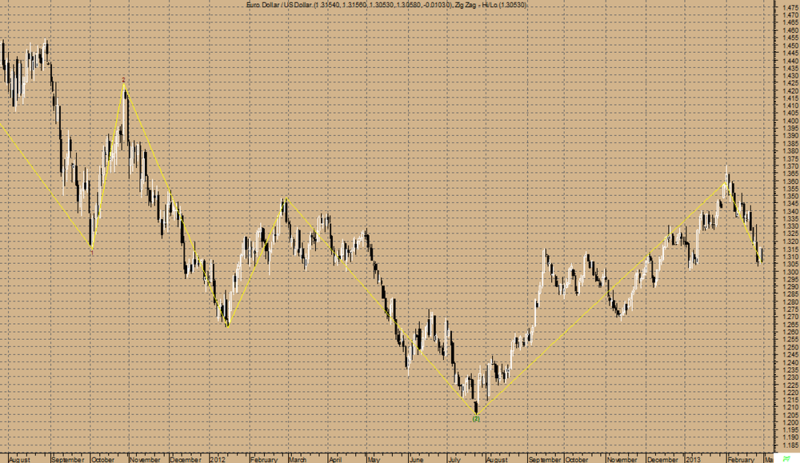 Elliott Waves High Volatility has detected a possible point 4 of a WolfWave (21%) pattern for Euro Dollar / US Dollar. This pattern is an expanding triangle and trades from the next point. When the peak or trough will form, usually after crossing or touching the extended line of points 1 and 3, the price will move in the opposite direction towards the target line formed by the extension of points 2 and 4. Euro Dollar / US Dollar is long term Bullish as the 144 days moving average of 1.31 is increasing. The Relative Strength Index is at 36.23 in the neutral territory. The Relative Momentum Index is at 31.63 in the neutral territory. An important indicator for Elliott waves, the Elliott oscillator is at -0.02, in negative territory; this is a bearish sign. An equally important indicator, the STORSI is at 25.06. This value is in the oversold territory. 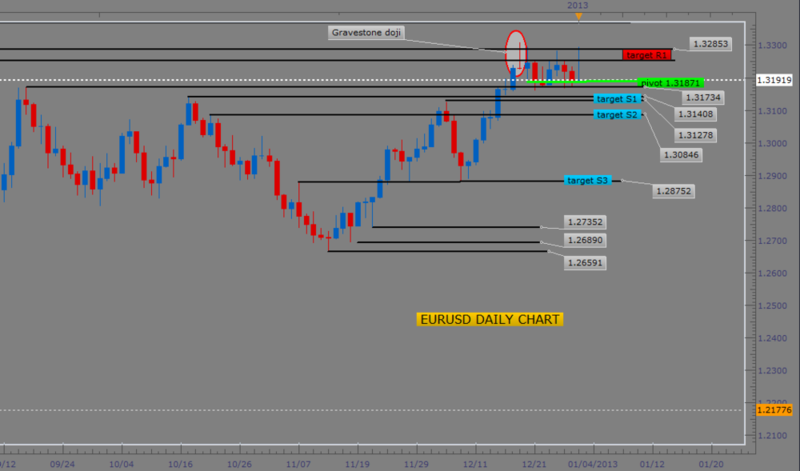 Just 6 days back on Monday, the EUR/USD pair was making a technical bounce at a support line that signaled an uptrend. It seems to have hit the resistance, but I never expected it to go to as low as 1.3018. The one encouraging sign for bulls is that the exchange rate is well under the near term 30 day moving average. The 1.3500 level could be the long term resistance and this leaves me with a hunch that trading weekly calls on the EUR/USD makes a lot of sense. Euro Dollar / US Dollar broke below the downside support level of 1.31, 1 day ago. This is a bearish sign. This previous support level of 1.31 may now provide upside resistance. Prices having only declined 0.31% since the breakout, the validity of the breakout is questionable. The most recently confirmed upside resistance level for Euro Dollar / US Dollar is around 1.34. Expect prices to have some difficulty rising above this level. A break above this level would be a bullish sign. Its going to be an action filled day with the ECB and BOE rate decision due for release later. With that in mind our currency pair for today is the most feared or is it favoured pair, the EUR/USD.  It would be a pleasure to know how your trade turned out. Do let us know. 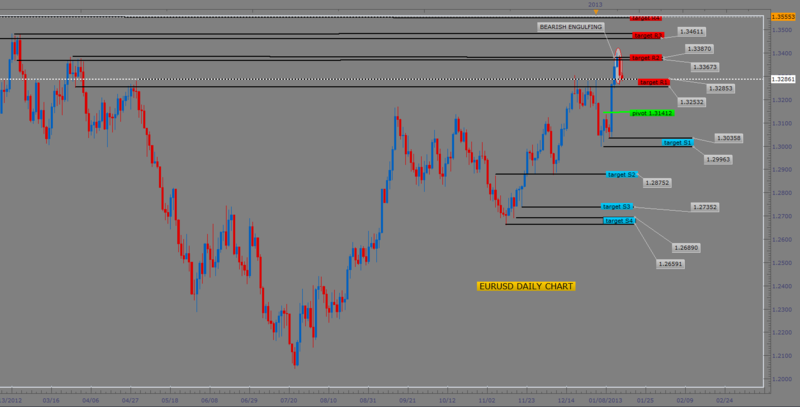 Anybody sold EUR/USD on the NFP announcement? It’s up again and and closed above 1.2980 - a near term support level for me. 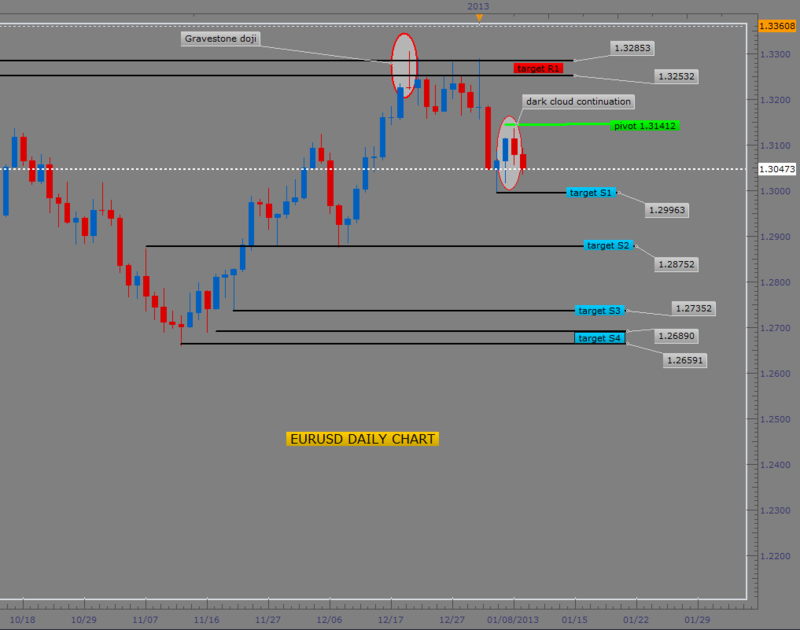 Actually I made some profits shorting EUR after the NFP release. It was a pretty wild week indeed. How are you able to get short after the NFP release early enough to make a profit ? What are you using for a news source that you can get in so early ? I thought that right after an economic announcement as important as the NFP that it was impossible to get a trade order in because there are so many trades being executed at that time. Please explain. Forget the technicals for Monday as fundamentals will be the main drivers of the prices at Euro, as debt crisis escalates hittting Cyprus deposits. In the event of a collapse of the Euro & the Dollar how would one stand if long /short? well the TA implys just that!